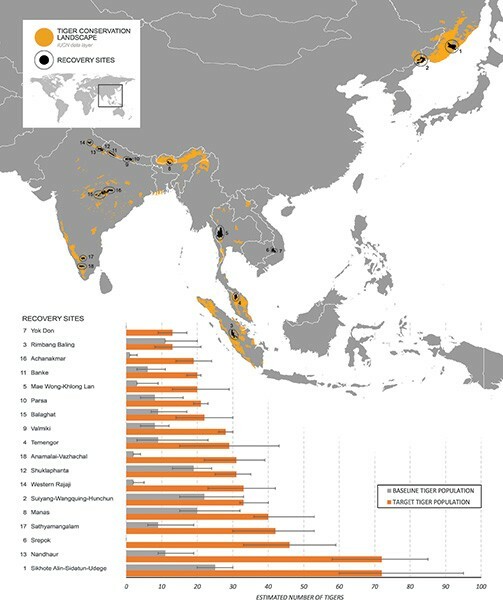 A new study conducted by 49 conservation experts from 10 tiger-range countries suggests that tiger population in 18 recovery sites across Asia, which currently support an estimated 165 tigers, could more than triple to around 585 under ‘optimal circumstances’. Given strong site management, anti-poaching measures and a stabilised prey-base for the predator, the 18 sites, identified under World Wildlife Fund’s global tiger conservation programme could contribute up to 15 percent increase in the global tiger population within a human generation. “Each tiger site is unique and requires intensive efforts. Our assessment serves as a template to guide planning for population recovery in other sites globally and helps to inform more effective, integrated approaches to tiger conservation,” said Abishek Harihar, population ecologist and lead author of the study. According to the study, stabilising prey population and comprehensive systems to minimise human-wildlife conflict are strong pre-requisites. “The presence of wild tigers represent thriving biodiversity and indicate healthy ecosystems—as apex predators, tigers can only survive with a stable prey base,” said Global Tiger Forum’s Secretary General Rajesh Gopal. In 2010, the global tiger population reached an all-time low of around 3,200, prompting the governments in 13 tiger-range countries to commit to TX2 at the St Petersburg ‘Tiger Summit’—the global goal to double the number of wild tigers by 2022, the next Chinese Year of the Tiger. According to the study, the goal to double tiger numbers by 2022 may be ambitious given the limited time frame but significant and sustained conservation efforts could help achieve the goal. “We’re at a critical juncture for tiger conservation, where we can bring wild tiger population back from their devastating decline but a concerted effort is needed to reach it,” said Margaret Kinnaird, leader of the WWF’s Wildlife Practice. Since the beginning of the 20th century, both the population and range of wild tigers have been estimated to have shrunk by 95 percent, due to rampant poaching and habitat destruction, which directly resulted in a poor prey-base. Earlier this year, Nepal made international headlines as the first country on track to meet the TX2 goal but poaching, habitat loss and prey depletion are the biggest challenges to reach the goal. “It is imperative that our high priority actions including protection, management standards and community-based conservation are targeted towards addressing these issues,” said wildlife lead at WWF Nepal, Kanchan Thapa. According to the latest tiger census report, the number of tigers in Nepal nearly doubled in the last decade from 121 in 2009 to 235 this year. The last census conducted in 2013 recorded 198 tigers. Shuklaphanta, Banke and Parsa are the three sites identified in Nepal which currently sustains fewer tigers than their carrying capacity and where conservation intervention holds potential to enable tiger population recovery.